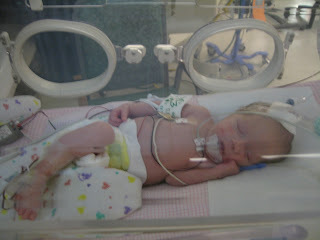 A year ago today the babies were still in the NICU. Before you leave the hospital the NICU staff assures you that they will call only if there is a problem. So you can assume that no news is good news. The flip side of that is when your phone rings at 1am and the caller id shows the NICU, your heart skips a beat because you know the news is bad. That was the situation one year ago today about Molly. They called to tell us to get to the hospital since they didn’t think Molly was going to make it through the night. I’ll never forget the terror that I felt; it’s every parent’s worst nightmare. My poor little Molly looked so frail and she was so pale that there wasn't a color to describe her skin. By the time I got there she was getting a blood transfusion and had yet another IV in her forehead. All I wanted to do was hold her and tell her that everything will be OK. But she was too sick to be held so all I could do is pretend to be brave and sit by her side. While everything turned out to be fine, it was a rough five days while we waited for lab results. We lived in fear for the worst and had to endure listening to the doctors argue over her treatment. Some wanted to play it safe another wanted to be more aggressive and we were flat out confused. On Christmas morning we finally got the good news that she was OK and that she was going to be fine. Last night I mentioned to Brett that today was Molly’s scary anniversary. He couldn’t believe that I can remember the day, and I can’t believe that he could possibly forget. I’ll never forget that day, and I’m glad. It makes me grateful for what I have, which is nice when things get rough around here. My sweet girl one year ago! That is something no one should ever have to go through, I am so sorry but glad she is alright! Such a moving story. It made me teary. I am so glad everything turned out alright. OMGosh what you have been through. Isn't it amazing to look at your babies now and remember how it all began. I remember the NICU/HDU and Special Care Nurseries all to well, and the graduation from one to the other was a glorious feeling. What a lovely thing to be told on Xmas, but what a terrifying experience. Popping in from The Red Dress Club site. So glad this story has a happy ending! Whoever penned the line about your heart walking around outside your body when you have a child was right on. So scary. So happy it turned out well!